After an auto accident confines Rik to a wheelchair, it seems there is no future for him and Margreet anymore. Then a way miraculously opens whereby they are united in marriage much sooner than they expected. "Hey, Margreet! Don't run so fast! Didn't you see me?" Margreet stopped at once and looked around in surprise. Crowds of people hurried up and down the wide aisles of the department store. An endless stream of faces flowed past her. She was nearly swept along as if by a wave in the surf pushing her closer to the shore, but she turned and stood still in the middle of the aisle. Brushing aside some rude comments, she quickly made her way to the side. She glanced around again at the swarming mass of people. She could stand there for hours watching all those faces. Each face had different characteristics behind which were hidden a story of their own. Each person bore his own history. But where had that familiar voice suddenly come from? From in the middle of all that noise and hum of voices, someone was calling her name. At least the blaring music was muted by all that noise. Then, all at once, she saw someone who was struggling to free herself from that stream, too. "Nel! Where did you suddenly come from?" "Well, well, you finally spied me," Nel laughed as she tried to get over to Margreet. "Wow! Is it ever busy today! What are all these people doing here?" she panted as she finally stood by Margreet, who had pressed herself against a display case holding crystal ware. "It looks as if all of The Netherlands is shopping here. Is this store giving away something for free?" "Those people could ask us the same thing," Margreet chuckled. "How nice to see you here unexpectedly. I heard you call me, but at first I didn't see you." "No wonder," Nel puffed as she looked over the mass of heads. "Come on, Margreet, it's too crowded in here for me. I have found you, and I'm not going to just let you go like that. Let's go somewhere where we can sit down and talk, or don't you have time?" "I was just planning to go to the bus," Margreet said, "not because I don't have any more time, but because I was beginning to get sick of all the busyness." "Good," Nel nodded in agreement. "Then let's find a place where we can at least have a decent conversation without having to raise our voices and push against the crowds. I know of a quiet restaurant close by. I'm paying. Okay? Follow me!" With an amused gleam in her dark eyes, Nel looked at the broad stream of people, wondering where she could best cut in. With a nod at Margreet, she made her attempt, and in an amazingly short time she was near one of the exits, with Margreet following her. Once outside, the girls breathed a sigh of relief. The restaurant was nearly full, but fortunately they found an available table with a couple of chairs in a far comer. With a sigh Margreet eased herself down onto a chair. Then she began laughing heartily. "Oh, Nel!" she exclaimed. "What's the matter?" Nel asked, who was already poring over the menu. "Did something tickle you?" "You are still the same unflappable Nel," Margreet laughed. "If only you could have seen yourself: You headed straight through the crowd like a general on a mission, with one goal in sight-the exit door. Everyone made way for you." "I wasn't rude, was I?" Nel asked, a bit startled. Margreet shook her head. "Don't worry about it; but if you had done that in Canada, at every step you would have had to say, 'Excuse me.'" "Then it's a good thing I live in The Netherlands," Nel stated matter-of-factly. "Oh, Margreet, here comes a waitress. What may I order for you?" "Something to drink will be fine." "Okay. Something to drink. Let me see," Nel said, chuckling. "A piece of cake too?" "We aren't 'poor' students anymore, Margreet." "No, I know that. Then, may I leave it up to you?" Nel nodded. "That sounds fine." She gave the girl their order and then, with a deep sigh, looked around. "Well, it certainly is better here than in those packed-full stores. What were you looking for anyway, Margreet?" She glanced at the bulging bag that Margreet had set under her chair. "I could ask you the same thing," Margreet laughed. "You have that right," Nel chuckled, who had a couple of plastic bags beside her, too. "Oh, you know how that goes: A couple of ads, a couple of specials, and then I thought I really needed a few things for later. In the past, girls began working on their hope chests when they were fifteen or sixteen years old, embroidering sheets and pillowcases, and so forth, but I never could get myself to do that. Of course, there are other things..." She looked dreamily out the window. Margreet sat watching her. She thought about the news that Willie had brought home one time: "Mr. DeHaan is engaged, since they saw him walking arm in arm with a dark-haired nurse." At the time, she had considered that news interesting, but afterward she hadn't given it any more thought. Now she was sitting across the table from that dark-haired nurse. "How is Mr. DeHaan doing?" Margreet asked. Nel started laughing. "Oh, Margreet, that sounds so strange to me. That's understandable, of course. He was our teacher for five years. You will probably hear more about Marco because your sister is in his class. I heard she's a nice girl. Does she resemble you?" "Thanks for your compliment," Margreet chuckled, "but I imagine you hear quite a lot about school from... uh... your friend." Nel shook her head. "Just say Marco, Margreet. That's much easier. You will probably see us more often. What will you say then? Nel and Mr. DeHaan? What a nice combination! I am planning on inviting you to our engagement party, too. Don't look so shocked. It will be a while yet, maybe around Christmas." Margreet nodded. She was a bit overwhelmed. Mr. DeHaan had always been a favorite teacher of the girls in her class. A half year after their final exams, when the group was all together, Nel had suddenly announced to them that she and Mr. DeHaan had become close friends. Margreet remembered that, at the time, it had created quite a stir, as none of them had noticed anything unusual at school. Nel had said nothing more about it, either. She had only very cautiously stated that Marco had politely waited until after she had finished her final exams. Margreet recalled that Nel had always been the most sensible one of their group. She also appeared older and more cautious. "That's because I grew up with adults," Nel had said once. She was an only child, so she had never had the opportunity to quarrel or get into mischief with brothers or sisters. "A penny for your thoughts, Margreet," she suddenly heard Net say. "Come back to reality and have something to drink." A tray was being placed on their table. "Oh, Nel! Cream puffs!" Margreet exclaimed. "That looks good! Thank you." "Try one first before you thank me," Nel said. "We no longer have to scrape together some dimes to buy a filled almond cookie. Do you remember that?" She laughed. "Where were you just now in your thoughts, Margreet? You weren't even paying attention to me anymore. It's a good thing the cream puffs brought you back down to earth." "I was in school again for a moment," Margreet smiled. "It came about because of your... uh... Marco." "Well done, Margreet. You are learning fast. Yes..." Nel stirred the big glass with her straw, making the ice cubes tinkle softly. "We surely had a nice group." "Except for during the time when Elizabeth was there." "Do you mean Betsy? Oh, yes, what a pitiful character." "I haven't figured out yet how I could be so duped by her." Margreet blushed as she thought about it. "At times, we all have to learn the hard way," said Nel. "She wasn't such a bad person. The only way I can see it is that she wanted to try to compensate for her circumstances at home. You won't let it bother you anymore, will you, Margreet? I have never heard anything more from her. It's strange. I never had much contact with her, but still, I wouldn't mind knowing how she is doing." Margreet shrugged her shoulders. "Sometimes so many memories come back to me, especially whenever I talk with someone from school. And then there was Tineke." "Yes... Tineke..." Now Nel was also silent. "At the same time, I think it formed a special bond in our group. Don't you agree?" She looked questioningly at Margreet. "We went through it all together. It certainly was special." "Margreet, you are daydreaming again," Nel said. "Where are you now? I see on your face that there is love in your heart." Margreet blushed. "You notice everything," she said and looked at Nel sheepishly. "See," she nodded, "I could tell it on your face. You looked so different from the evening when you were at my house. Tell me, Margreet. Who is it?" "Rik Verhoog? Tineke's brother? Oh, no wonder the name Tineke put you on cloud nine." 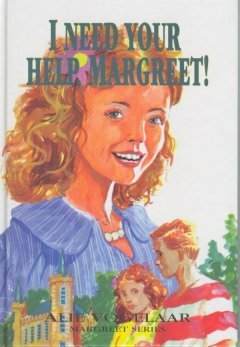 "I'm not kidding you, Margreet, but I still recall that during the evening you briefly mentioned that in Canada you had a bad experience with a boy who never went to church. I remembered it right, didn't I? Well, then I'm especially glad to hear that now it is different. Rik seems to be a nice person, and he goes to the same church as you do, which is very important. If you cannot talk things over together or if there are major differences... I can truthfully say I cannot imagine what it would be like, but it seems that later it would bring nothing but huge problems. How long, uh... No, I may not ask that. But I will be expecting to see both of you at my engagement party. At the same time, I will have the chance to get to know him a little better." "When will your engagement party be?" "At Christmas time, Margreet. I think I mentioned that already. Marco is already twenty-six, and we have known each other for quite a few years already, so he doesn't want to wait long. For that reason, I have been buying a few things now and then." She glanced at the shopping bags. "In any case, I will finish my nurses' training first. I won't get married until then. Marco understands that too. I'm not the kind of person to sit in the house the whole day after we're married. Of course, you never know..." Nel stammered for a moment. "Hey," she said then, "isn't your mother expecting a baby? I haven't heard any more about it." Margreet looked at her. It seemed as if Nel was jumping from one subject to another, but Margreet sensed the reason. "I should have called you," she answered, feeling a little embarrassed. "I completely forgot, really, but I have received a cute little brother. He's already a month old." "I will come over sometime to see him," Nel said. "Boy, it sounds wonderful to have a baby in the house again." "It is, really," Margreet agreed. "At first I didn't like the idea," she confessed. "For one reason, my brothers and sisters aren't very little anymore, and my mother is getting older. Besides, there is always the fear that something might go wrong; but, thankfully, everything went very well." "All that time you probably had to help at home, didn't you?" Margreet nodded. "Yes, but not the whole week. I worked somewhere else besides. Now I'm working in a children's home." "Oh, yes, I remember how enthused you were about the home in Canada," Nel replied. "Do you have a job already?" "I applied at three places. In fact, I have visited two of them already. They immediately invited me to come and take a look. The first one didn't appeal to me. It was close by, not even an hour's drive away. It would have been convenient, but the director was very cold and professional, and not at all pleasant. I saw very little of the home or the children. However, the second home was just the opposite. The director there was the motherly type, very warm and pleasant to speak with. She showed me all around, and just yesterday I received an invitation to come and work there." "Well, it's quite far away, way out in de Achterhoek. By bus and train it will take me four hours. It is in quite a remote location." "Then you probably won't be able to come home every Sunday, will you?" "No. It wouldn't be possible, anyway, because every other Sunday I will have to work, just like in a hospital. Of course, it is quite far. I haven't given it much thought yet. Maybe I can come home every six weeks or so." "Well then, if I were you, I would start thinking very seriously about it," Nel said. "Once in six weeks! Margreet! Do you think you can keep that up? What does Rik think about it?" "Rik?" Margreet looked at Nel hesitatingly. "Yes, of course. If you have a boyfriend, you have to learn to take him into consideration." For a moment Margreet didn't know what to say. Of course... Rik. She hadn't even called him yet to let him know that she could get a job in that children's home. She thought she had to make that decision herself. But Nel was right. She couldn't do that. She should have talked with Rik about it first. This didn't concern just herself. How thoughtless of her that someone else had to tell her this. She blushed to think of it. "When do you have to decide?" "They gave me a week to reply." "Oh, then you still have six days left. Haven't you received a response to the third application yet?" "That's strange," Nel said. "Where is it?" "It's also not very far away. It's close to Utrecht." "Tineke told me once that Rik is studying in Utrecht," Nel said. "Boy, that would be ideal! If I were you, I would inquire there once more." Margreet said nothing for a moment. When she thought about that pleasant place in de Achterhoek... Nel could easily talk. She didn't have to accommodate everything to Rik right away, she thought a little obstinately. However, those thoughts passed quickly, as she knew Nel intended well. She was a sensible girl, and Margreet had learned a lot from her the last half hour. Nel noticed that she hadn't received it very well. She smiled, picked up the bill, and said, "All talked out, Margreet? Or is there something else on your mind?" "I could keep talking for hours," Margreet confessed. "I'm glad we had a chance to see each other again, Nel. So many memories have come back again, from school, and so forth. We should do this more often." "It would be nice to do it again," Nel agreed, "but I have Marco too, you see. Then there's also my work and my studies, and my parents would like to spoil me for a while yet before I move out of the house. Sometimes I think I need twice as much time in a day to do everything." She sighed. "Come on, Margreet, don't look so shocked at your watch. I will bring you home. You're my guest, so that goes along with it. It's only a short drive to your village, even though with the bus it takes almost an hour." "Do you have a car?" Margreet asked in surprise. Nel laughed, a little embarrassed. "Oh yes, if you're an only child... My father wanted to spoil me a little yet." Nel's car, a small red one, was parked nearby in a big parking lot. "Since when have you had your driver's license?" asked Margreet. Boy, what a nice little car, she thought. By the time I would have saved up enough money for something like that...! Then it wouldn't be difficult to take a job like the one in de Achterhoek. "Immediately after I graduated from school," Nel said as she started the car and drove out of the parking lot. Now she was silent, because it was busy on the road, and she needed her full attention to wend her way through the traffic. Soon they had left the city bustle behind. "I think I will have to learn how to drive very soon too," Margreet said. "But of course I will have to earn some money first." Nel didn't say much more as they sped over the narrow roads leading to the village where Margreet lived. "I will take the bridge," she said, "which is much quicker." "Too bad," Margreet laughed. "Otherwise we could have seen Jansen again, eh? But then maybe we would have had to wait, eh? And maybe the ferry boat is full, eh?" Nel laughingly shook her head. "Oh, oh, Margreet. This afternoon we are acting just like a couple of old women getting together to refresh their childhood memories." "That's what happens when you get old," said Margreet seriously. Nel burst out laughing. "Be quiet now, Margreet. I have to drive straight on the dike." "Please don't," Margreet exclaimed. "That dike is curvy, Nel. You can't drive straight on it." "Are you always so quick-witted? Oh, finally, here we are. Say, I will go in for a moment, to see your new little brother. Is that okay? Otherwise, later maybe nothing will come of it." "Of course," Margreet nodded. Too bad she hadn't thought of it herself. It would have been better if she had asked Nel to come in. In that respect she was a little slow. She thought too little about others, she reflected, feeling a little ashamed. 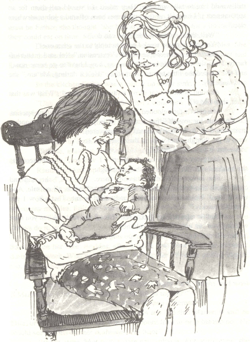 Nel could hardly be pulled away from the baby's bassinet, and she waited just so long until Mother laughingly asked her if she wanted to hold the little boy. "I was just waiting for you to ask that," Nel said truthfully. She sat gently holding the baby on her lap. The little Marien lay there with his dark eyes wide open, staring at Nel. "It looks as if he has to investigate who is holding him," Nel said. "Oh, what a serious, searching gaze." But it didn't last long. "Hey! Now he's laughing. I must meet his approval," she chuckled. "Hi there, boy!" In the meantime, Margreet looked to see if there was any mail. "There's something for you on the stairs," Mother said. Margreet ripped open the envelope. "Well!" she said in surprise. She looked at Nel. "I got an invitation from the third home, after all. We were just talking about that this afternoon, remember? They wrote that, because of unforeseen circumstances, they are a little bit late, but that they still would like to talk with me. They asked if I would call them for an appointment if I haven't, in the meantime, been offered a job somewhere else." "Well, then you know what you can do." "Yes, but within a week I have to reply to the other one!" "Then ask for a couple of days' extension," Nel said matter-of-factly. Then she said to the baby, "Come on, boy, I have to go home now," and she handed the little one to his mother. "He's a darling, Ma'am," she said sincerely. As soon as the red car drove away, Mother asked, "What was that letter about, Mar?" Margreet's face clouded. She was about to say, "Nothing special. I'll find out for myself," but she kept it in just in time. "It's another invitation from a children's home," she answered. "I don't know yet if I want to go, though. I can work in that other one, so..."
"This one is probably closer?" Margreet shrugged her shoulders. "I will see," she muttered as she headed to the stairs with her shopping bags. She looked at Mother standing there. "Oh, yes," she said and came back. "Do you want to see what I bought? It was all on sale. And was it busy! Nel saw me suddenly and called to me. That's how I got home so quickly." Mother admired her purchases. "Nice," she said. "When you start working you can use some more clothes."